Hire Mushroom Display Cabinets, Mushroom Display Cases and Mushroom Showcases Premium quality, unbeatable prices! Hire online now! 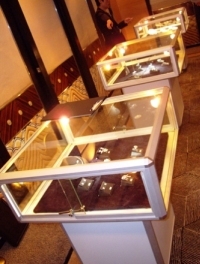 The perfect Jewellery Display Case for hire! For professional visual merchandising, Showfront Mushroom Display Cabinets are a superb addition to any retail display. Perfect for viewing jewellery, giftware and small valuable items from all angles, Mushroom Display Cases enable you to showcase your merchandise front and centre on your retail floor. Mushroom Display Cabinets from Showfront come fully assembled and ready-made or custom built. Buy online now! With over 20 years experience, Showfront is Australia’s leading manufacturer and supplier of Hire Showcases. Compare the difference in price and quality - visit a Showfront showroom in Sydney, Melbourne or Brisbane. Hire Counter Display Cabinets online now or call our friendly team on 1300 785 694.